Pork blended with red Leicester cheese, jalapeno chillies and seasoning and filled into natural casings. 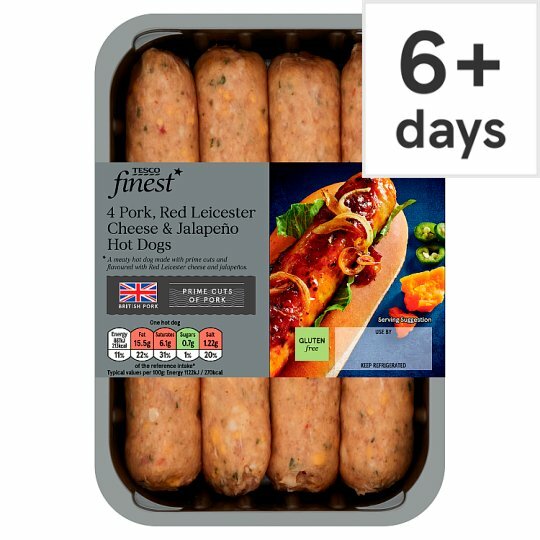 INGREDIENTS: Pork (72%), Water, Red Leicester Cheese (with Colour: Annatto) (Milk) (6%), Jalapeño Chilli (3%), Potato Starch, Red Pepper, Rice Flour, Chive, Salt, Stabilisers (Tetrasodium Diphosphate, Disodium Diphosphate), Dextrose, Ground Spices, Preservative (Sodium Metabisulphite), Sage, Sugar, Bamboo Fibre, Garlic Powder, Smoke Flavouring, Emulsifier (Glyceryl Monostearate), Caramelised Sugar Syrup, Colour (Paprika Extract), Sunflower Oil. Instructions: For best results do not prick sausage skins. 190°C/ Fan 170°C/Gas 5 25-30 mins Place onto a lightly greased baking tray in the centre of a pre-heated oven for 25-30 minutes. Turn occasionally. Instructions: For best results grill. For best results do not prick sausage skins. Place under a pre-heated medium grill for 17-20 minutes. Turn occasionally.